Most sightings and photos seem to come from the High Peaks region on mountain summit trails or at leantos with food the attractant? In the southern Adirondacks, have never seen reports. Do populations exist in Warren, Saratoga, Fulton, or Southern Hamilton County? Last edited by Grey-Jay; 03-07-2019 at 07:10 PM.. I know you can't see much from this photo but if you zoom in you'll see either a marten or fisher. 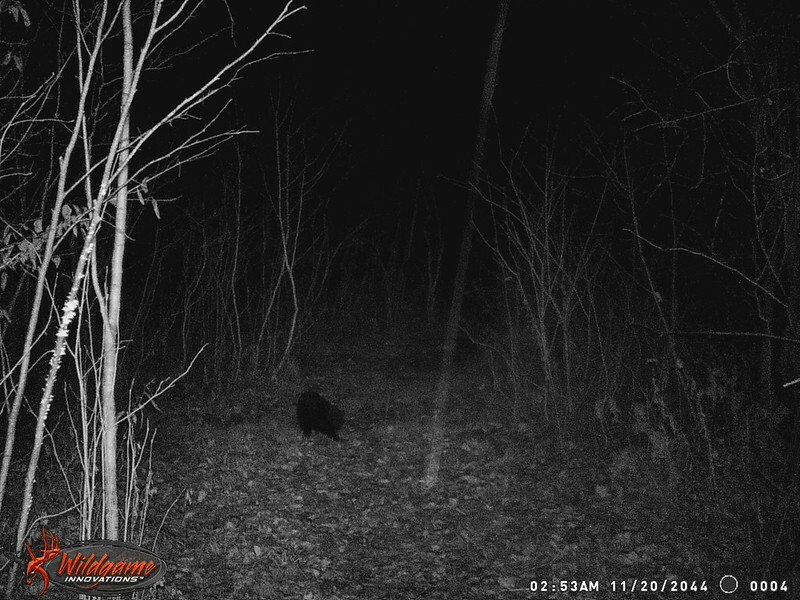 It was taken last year in Fulton County (date is wrong on the camera). my neighbor saw a fisher this winter. Have see them just north of the Warren County Line in South Schroon. Have seen two in the Lake George WF, one at Fishbrook Pond, the other toward Shelving Rock Mt. A couple of years ago, I very clearly saw a fisher cross Fox Hill Rd near Archer Vly (Saratoga Country). It was winter and there was a lot of snow on the ground, but the road was plowed. It stopped right in the middle of the road and looked at my car. It had a little critter in its mouth. I stopped my car and watched it. No camera. It stayed maybe 20-30 seconds before it dashed off into the woods with its meal. Made my whole day. I can't speak for the critter in its mouth though. Not sure about pine marten, but I have had quite a few friends lose chickens to fishers in Saratoga County. Pretty sure these folks had permits from DEC to dispatch the fishers when needed as they had destruction of property issues with them in the past. However, I only personally saw a fisher caught/killed one time throughout the years. If I remember correctly, the Pine Martin was first reintroduced back in the 70's in the High Peaks area. I saw several in the Indian Pass Brook area while deer hunting. Cute little buggers! Very tame at that time. I even had one in my tent! They prey mainly on red squirrels, so I've read. There is a an abundance of them (squirrels) in the spruce growth in that area. Fishers just love snowshoe rabbits. There has been a controlled trapping season for them for quite a few years. 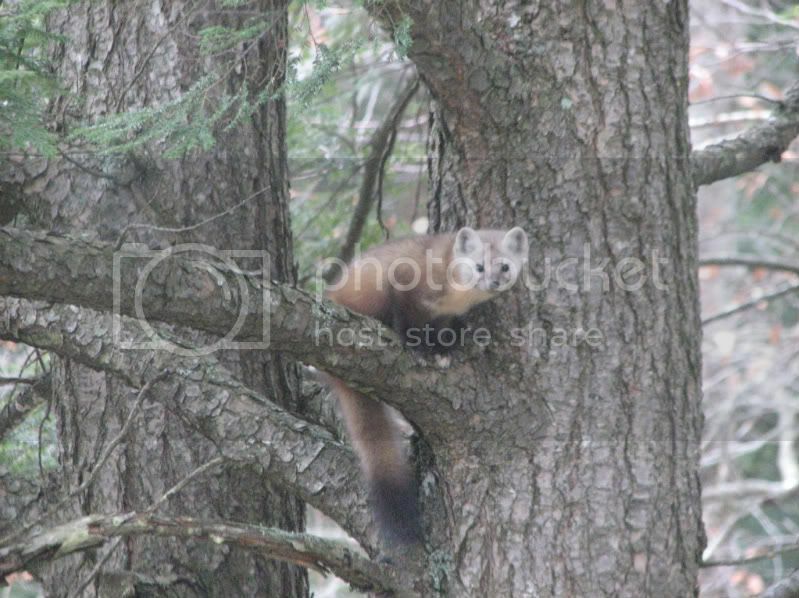 I've seen both pine Martin and fisher in Morehouse. The pine Martin had two youngsters chasing each other. It was pretty awesome to watch them. Pine Marten are thriving in northern NY, there are many in northern Herkimer County. Last fall when I contacted Region 6 biologists to acquire my Fisher trapping permit and tags, he told me that there had been a confirmed sighting of a Marten in Oneida County near Rome, NY. He also stated that they are now inhabiting Tug Hill. 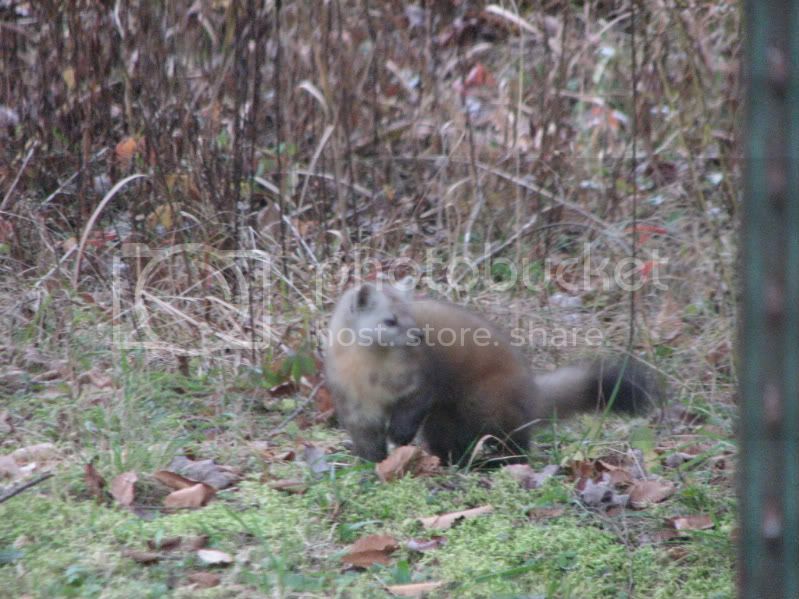 Saw a couple of pine marten chasing each other when hiking up Buck Mtn near lake george a couple of years ago. Only now have I learned that the title of my post was in error. The proper name of the marten in our region is the American marten. Pine marten refers to the marten native to Europe. Spooked this guy out of my wood pile while I was chopping wood. I was lucky enough to get a pic as he was running away. The owl attacked but after a brief scuffle, the weasel shot out and ran into the woods. Seen Fisher and their tracks often here in se Broome County, even had one on our back porch. Speaking of Fisher, I noticed a fresh set of tracks in the backyard this morning and took 2 photos with a 12in ruler alongside. I saw a Pine Marten trap high up on the ridge of Lewey Mountain 2 years ago. It was bizarre to see in the absolute middle of nowhere way up on the ridge. I caught a photo of a Pine Marten on Netop Mountain in Vermont last year. Really cool to see as that was the first time I had ever encountered one. Luckily, someone had a photo this time. Could barely shoot one with all these modern cameras.